Because of low rainfall and lack of irrigation infrastructure, water management is often not an option for rainfed lowland rice farmers. But, thanks to the latest rice breeding research, recently developed varieties that produce higher yield under drought have their own built-in water management strategy. These plants can capture and use water more effectively when it is limited. By planting these drought-tolerant varieties, rainfed rice farmers can take advantage of the limited amounts of water in their fields that otherwise would not be accessible if drought-susceptible varieties were grown. Interestingly, each drought-tolerant variety appears to have its own unique water management strategy composed of multiple traits. Many of those traits are expressed by the plant only when it is stressed and not when it is growing under favorable (well-watered) conditions. By selecting for yield under drought, the breeders who developed these varieties were, in fact, also selecting for the optimum combinations of these various traits. Sometimes, one drought-tolerant variety can show the opposite response for a trait compared with another drought-tolerant variety depending on what other traits are expressed in that variety. Why would a plant’s strategy for having higher yield under drought be so complicated? This is probably because drought stress itself is complicated. Drought can occur at any growth stage, it can be intermittent with some rain in between, or it can develop progressively. And, it can range from mild to severe. Rainfed rice farmers cannot predict what kind of stress conditions might occur in a season—and neither can rice plants. Therefore, the plants that can respond to the stress in a variety of ways are probably those that are most resilient to unpredictable levels of stress. Several drought-tolerant rice varieties have been released over the past decade and more promising genotypes are in the pipeline for testing and release as varieties. These varieties were selected for their grain yield under drought, but we have also been tracking their drought-response traits along the way. 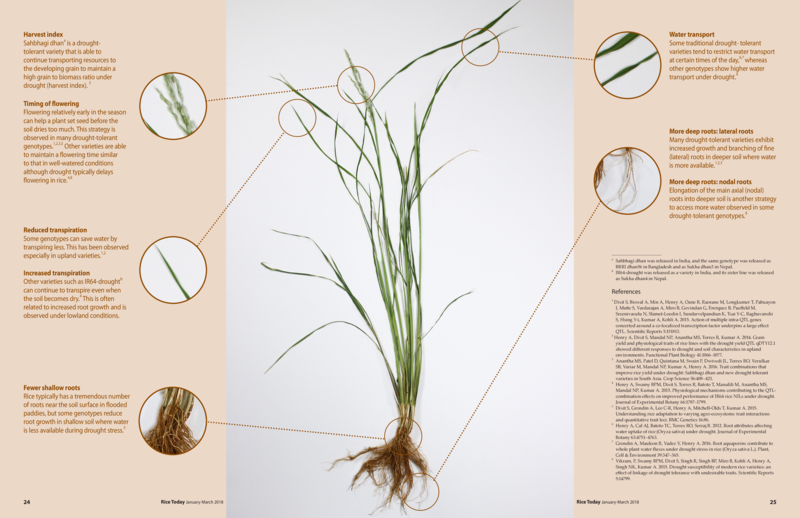 Based on our work at the International Rice Research Institute (IRRI), the diagram (above) summarizes some of the unique strategies of different drought-tolerant varieties. These varieties can help manage the limited available water in rainfed systems—even when farmers cannot. Dr. Henry leads the Drought Physiology Group at IRRI.